The dissonant sounds of oil splattering, bones breaking and violin whines bounce around the hallowed structure of London’s Camden Roundhouse on a night like no other. Radiohead’s Johnny Greenwood and the London Contemporary Orchestra perform Greenwood’s hauntingly beautiful score live to a screening of Paul Thomas Anderson’s masterpiece There Will Be Blood. A young orchestra sits on the stage as the Miramax logo presents itself for a false start on the projection behind them. They are surrounded by an aptly decorated Roundhouse, with industrial looking, metal tiered seating structures and lighting rigs. After shortlived familiar sounds of an orchestra tuning and a voiceover announcement, the conductor raises his hands, with players and instruments at the ready. The live score begins as the introductory credits roll and the audience latecomers take their seats. To those unfamiliar with how film music is made and who maybe haven’t given much consideration to the musical sounds that colour the movies they know and love, this is quite an unveiling experience. A real live orchestra sat right before you, in front of the familiar screen, playing just like any live orchestra does – all arms, bowing, hitting and blowing. The performers are not hidden away in a pit like in a musical or opera and so it is much more of an equal marriage. It really does bring the music to life! But it definitely takes a little getting used to, given there’s a whole other world and story being projected behind them to focus on too. 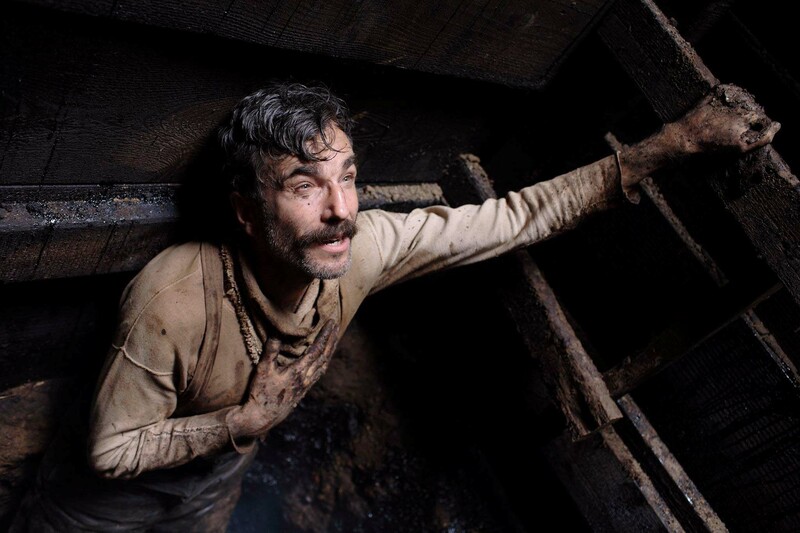 Paul Thomas Anderson’s absorbing film helps you deal very quickly with this, drawing you in almost immediately. You quickly forget you’re at a concert. Then the full string orchestra opens up for the first time. It really is an amazing, powerful feeling. With your eyes on the screen, it’s just like being at the cinema but with something extra which, for a brief couple of seconds, you can’t quite put your finger on. You just feel more immersed in the experience than you normally would at the cinema, and then you’re awoken from this trance and drawn back into the concert hall again. 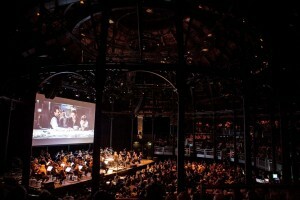 The sounds of the orchestra bouncing round the Roundhouse, enveloping you, the audioviewer. This live element turns the experience into much more of an event. The audience as a whole seems to feel more at ease with interacting with what’s in front of them – there is more laughter, more gasps, more audible squirms in the awkward moments. Your role as audience member is in constant flux – gliding seamlessly from filmgoer to concert-attender. It makes for an incredible experience. Perhaps these gear changes only work with a film as gripping and encapsulating as There Will Be Blood and a score as mesmerising as Greenwood’s. But who cares when you’re lucky enough to have such a combination right in front of you? Played-back sound from the film and live sound from the orchestra creates an interesting juxtaposition. In the powerful, epic parts of the score and film, the two gel very well together – explosive music with thunderous sound design, although there were just a few blending issues in some of the subtler scenes, most notably involving Greenwood’s instrument. Johnny Greenwood plays his own expertly crafted music amongst this orchestra of talented youngsters. He’s on the ondes Martinot, essentially a Theremin set to a keyboard. It produces a very ghostly sound that works very well amongst the orchestra in the recorded version of the film. However, at times in the live setting, it overpowered the orchestra and, even under the capable hands of Greenwood, it stood out a little too much in the unforgiving boomy acoustics of the Roundhouse. In fact, this problem of overshadowing also extended to the orchestra as a whole. There was a tendency in certain quieter moments of the film for the music to be in competition with the dialogue, making it hard to understand what the characters were saying from time to time. Although the music is on much more of an equal footing with the visuals in this live event that it is in its recorded counterpart, there needs to be some give and take, and too often the sounds of the orchestra did not yield for the voices of the onscreen characters. What’s more, in the recorded version of the music, there is much more control available to a music editor than there is between a conductor and live musicians – a fade-out can be done with microscopic precision; whereas a perfect diminuendo al niente for live orchestra is nigh on impossible – a difference which is rather disrupting to the tail ends of scenes when one has been conditioned to expect editing suite precision when sat in front of a screen. However this is perhaps an unfair comparison, so I’ll leave aside the nitpicking and move onto the wonderful the score itself. Greenwood’s inventive music mixes Penderecki-esque string slides with Radiohead-influenced pulsating rhythms. It compliments the film perfectly, offering eerie undertones along with fire and explosiveness. Such latter moments offer some amazing performance spectacles, like the thunderous percussion-heavy sections where the string section are all strumming their instruments like muted guitars in unison. Virtuosic solo passages are on offer too in the more romantic and somber sections of the score. Players are able to show off some beautiful playing in the more exposed moments. Such command of their instruments is even more impressive when you consider the performers – and especially the conductor – have to remain in a state of total concentration for the entire 158 minutes, even in their tacet moments. But it’s not just Greenwood’s music that’s on show. Music by Arvo Pärt can be heard and the anthemic 3rd movement of Brahms’s Violin Concerto in D major is used twice throughout the film. Including its somewhat ironic use to score the film’s shocking ending – where Paul Dano’s character’s skull is bashed to bits by a bowling pin – which the London Contemporary Orchestra swiftly turned into a traditional orchestral performance, with the first violinist performing upstanding for a truly grand – and brilliantly tongue-in-cheek – finale.